If we hold on to what needs to change, we inevitably create a continuous struggle. If we accept the changes that need to take place, we can close the door to what once was and flourish in the here and now. How extreme do events have to become before we are willing to let go of the past? How much abuse are we willing to take before we allow? Have you given your best shot at repairing what once was? Is there something more you can to improve the situation? Answer these questions honestly then re-evaluate your situation. Do so with a clear mind (not during a moment of despair). Sometimes the answer may be quite clear and other times it may not be clear at all. When we have exhausted all avenues available, change (whether extreme or minimal) may be the only option. Sometimes all that needs changing is our perspective. Sometimes we have to change everything. Life can certainly be a roller coaster ride. If the roller coaster is broken, repair it but if it is beyond repair, release your seatbelt and step out onto solid ground. Sometimes stepping off the roller coaster ride is more frightening than the ride itself but if the roller coaster is broken you will be left suspended in mid-air. Find the ride that is functioning perfectly for you. Buckle in and enjoy. Let go of the bars, raise your hands and know that you are safe. Enjoy your new ride with all of its twists and turns. 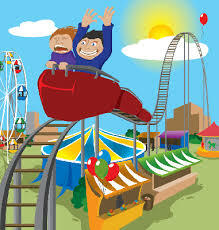 Letting go adds to the pleasure of the ride and having faith in the process (our safety belts) is all that we need. Life’s roller coaster can feel rickety at times and the ups and downs can be quite intense, but there are always other options. We CAN choose the roller coasters we want to ride.